Coatings & Corrosion Control steel ships are subject to greater degrees of hull flexing at sea. This is important when you consider the corro- sive processes in under-deck and ullage spaces,"
Jansen says. During ballast voyages, inert gas is pumped into the cargo tanks of tankers to prevent the build up of flammable gases from cargo residues. Inert gas is also used to fill up the ullage space left after a cargo has been loaded. The gas used is generally pumped in at a temperature of roughly 45 degrees Cel- sius. At night, the natural drop in temperature will cause the gas to cool to around 20 degrees Celsius. Even the thermos-flask characteristics of a double- hulled ship cannot prevent this. As a result, the walls lining the spaces filled with gas are covered in conden- sation. Rodney Towers' study suggests that in an inert- ed VLCC as much as 12 tons of condensation can be created each night. "The condensation dissolves sol- ubles in the inert gas mixture that trigger the corrosion process," Jansen explains. This is particularly damaging for ships with high lev- els of high-tensile steel. Their increased flexing during voyages leads to higher levels of flaking. Flaking exposes fresh areas of steel for the corrosive solubles to do their damage. According to Jansen, "By encourag- ing flaking, high-tensile steel is its own worst enemy." Sigma Coatings is addressing the issues raised by his research. Jansen will be helping the company better understand the requirements of modern tanker shipping. "Improved coatings, a clearer understanding of coatings on the part of crews, and investment in coatings by owners at the new- build stage will help prevent double-hulled tankers from causing more problems than they solve," he says. Christopher Pawlicki as the regional sales manager for Ohio, the Northeastern U.S. and Ontario, Canada. Pawlicki, who has an extensive background in industri- al sales, most recently served as a manufacturer's rep- resentative for various quality products. 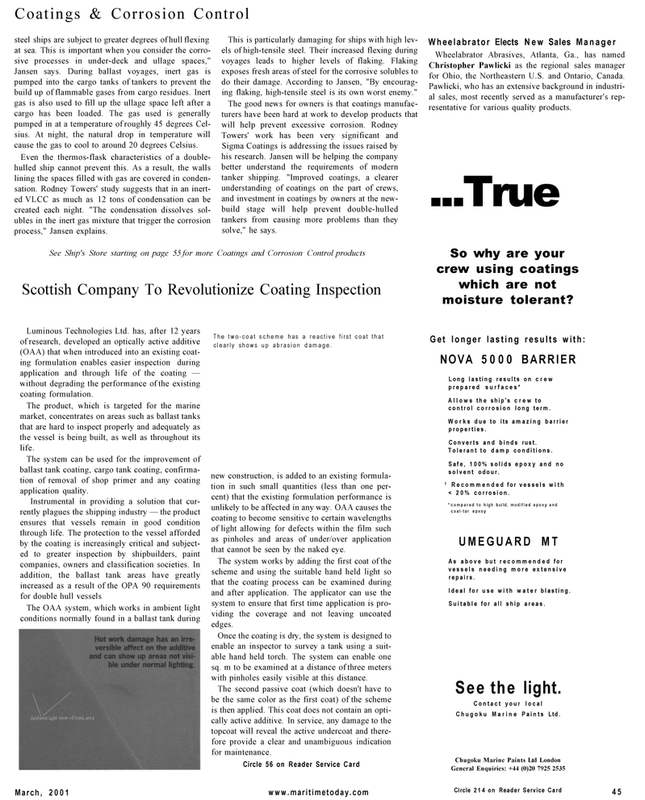 Luminous Technologies Ltd. has, after 12 years of research, developed an optically active additive (OAA) that when introduced into an existing coat- ing formulation enables easier inspection during application and through life of the coating — without degrading the performance of the existing coating formulation. The product, which is targeted for the marine market, concentrates on areas such as ballast tanks that are hard to inspect properly and adequately as the vessel is being built, as well as throughout its life. The system can be used for the improvement of ballast tank coating, cargo tank coating, confirma- tion of removal of shop primer and any coating application quality. The two-coat scheme has a reactive first coat that clearly shows up abrasion damage. new construction, is added to an existing formula- tion in such small quantities (less than one per- cent) that the existing formulation performance is unlikely to be affected in any way. OAA causes the coating to become sensitive to certain wavelengths of light allowing for defects within the film such as pinholes and areas of under/over application that cannot be seen by the naked eye. The system works by adding the first coat of the scheme and using the suitable hand held light so that the coating process can be examined during and after application. The applicator can use the system to ensure that first time application is pro- viding the coverage and not leaving uncoated edges. Once the coating is dry, the system is designed to enable an inspector to survey a tank using a suit- able hand held torch. The system can enable one sq. m to be examined at a distance of three meters with pinholes easily visible at this distance. The second passive coat (which doesn't have to be the same color as the first coat) of the scheme is then applied. This coat does not contain an opti- cally active additive. In service, any damage to the topcoat will reveal the active undercoat and there- fore provide a clear and unambiguous indication for maintenance. So why are your crew using coatings which are not moisture tolerant? Allows the ship's crew to control corrosion long term. Works due to its amazing barrier properties. As above but recommended for vessels needing more extensive repairs. Ideal for use with water blasting. Suitable for all ship areas.